The fate of central bank reserves sparked a clash between its head and the country's president. 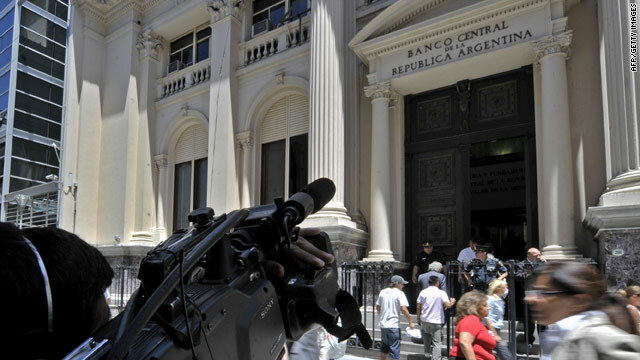 (CNN) -- A judge Friday halted Argentina's plan to use $6.5 billion in reserves to pay the country's debt -- the issue in a feud between President Cristina Fernandez de Kirchner and the central bank president she fired for trying to stop the procedure. Fernandez issued a presidential decree Thursday removing Central Bank President Martin Redrado from his post, citing "misconduct and dereliction of duty by a public servant." Redrado has said Kirchner cannot fire him. Federal Judge Maria Jose Sarmiento issued an injunction Friday preventing the government from carrying out its debt-reduction plan, said the Judicial Information Center, the government's court reporting service. Another federal judge, Norberto Oyarbide, will analyze the misconduct allegations in the president's decree firing Redrado, the Judicial Information Center said. A third federal judge, Liliana Heiland, will rule on a motion by Redrado to nullify the government's decree removing him from his post. Earlier this week, the president announced she had accepted Redrado's resignation after the bank chief declined to support her plan. Redrado replied that he had not resigned, and that only the Congress, not the president, could remove him. Opposition politicians advised Redrado not to abide by the decree and to seek an injunction to protect his rights. According to Redrado, the proposal to use central bank reserves to pay down debt should be studied to see if the request should come from the Congress, rather than the nation's president. Redrado's term ends in September. Sergio Berensztein, a professor at Torcuato Di Tella University in Argentina, said the outcome of the power struggle could set a precedent for how Argentina deals with increasing government expenditures in the face of low revenue. However, Berensztein told CNN en Español that decisions to draw money from the central bank must come from Congress, rather than presidential decree. "The most important thing here is that there is a overstepping by the executive in violation of central bank autonomy," he said.